Double Race Weekend – Double PR Weekend! I went out way too fast. Yeah…so obviously the negative splits didn’t happen, but it’s kind of hard to run when you can’t see where you are going through the ginormous rain drops. All in all I was happy to have finished the race with a good time. After grabbing a banana and a bottle of water, I went back home to shower and pack for the drive to Long Island for the Diva’s Half Marathon taking place the next day (We stayed overnight in a hotel). Race Day – I woke up and had my typical 16 ounces of water and a banana. I ran out of time to have my peanut butter and Nature Valley Breakfast Biscuits so I was worried that I didn’t have enough fuel. Race morning was very, very cold and windy (temperature was around low 40’s). The type of cold where my hands were numb (my hands didn’t “warm-up” until mile 2 on the course). We had to walk about a mile to the finish line which wasn’t very fun – especially when the wind is pushing you forward! The 5K runners started first around 7:45am and then the half-marathon started at 8:05am. This race started on time which I always appreciate. I hate starting 30 minutes after the “start-time”. …and we’re off! I positioned myself in the 9:00-10:00 minute pace group. I knew this was a little ambitious for me, but I knew I could sustain that time for at least the first half of the race and I was right! That’s my fastest 10K time to date! I was floored by that but this is where I have to give the course some credit. This course was mainly flat – just a few small hills – so this obviously helped me out! I was feeling really good at the 10K mark. I always run with a hydration belt for any runs longer than 6 miles so I had my grape flavored Nuun water available for quick sips whenever I started to feel like I was slowing down. Final Time – 2:15:46 – PR!! As usual with my races, I started to slow down at the end. I really need to work on finishing strong. I started to have some pain in my hip around mile 8 so I know that was a factor in my speed. Also around mile 10 I had a strong urge to break out the shmoney dance, but I held back (I did however do this dance when I got back home…with my medal around my neck). Oh, and I got another PR! I really wasn’t expecting a PR for this race because I missed about 5 days of training due to my London business trip in late September. I was still happy with my prior PR from 3 weeks ago at the Queens Half Marathon but I am proud of myself for shaving another 4:18 off of my time. The course was your typical race course. We did a few miles in the park (where the race started/finished), ran along the closed streets and residential areas and at one point I think we were on an off ramp from the highway?!?! To be honest I couldn’t really tell, it just seemed weird! One more thing to add. 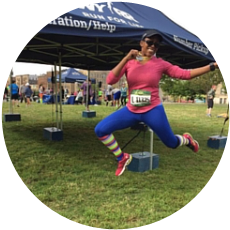 My mom ran the 5K race and killed it – she came in 4th for her age group (out of almost 50 people). I am so proud of her!! I also have two virtual races (Run 10 Feed 10 10K and Hunger Awareness Virtual 13.1 I will complete as well. I would like to sign up for some more half marathons in November or December, but the weather is so crazy here during those months. I’ll have to wait and see how much snow we get. What upcoming races do you have scheduled? Let me know in the comments section! Great job on your 5K and Half Marathon PR's! That is awesome! My next run will be the Perfect 10 Miler here in NJ and my last run will be the Philly Half in November! Thanks so much! The Philly Half would be a great race to add to my calendar – I might have to look into it!